Found on this web page are a number of the electronic design projects that I have done over the years, including: Amateur Radio, Robotics, and Live Steam. One of my old projects is a lighting design project that was designed and built to control a large number of lights for Christmas or other special purpose lighting displays. Christmas of 2010 was the last year for the display as I retired it. For details on any of these projects, select the Design Projects link and have a look. 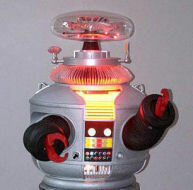 Another ongoing project is the construction of a full scale robot from the Lost In Space Series that ran from 1965-1967. This project will take many years as there is much to hand make and it looks to be a project that may be expensive. I have not worked on this project in some time, not enough hours in the day. To see the status of the B9 Robot, go to the Design Projects Link, then B9-Robot. I enjoy working with technology so follow this Amateur Radio link to see what I have been doing with communications. I started working with live steam train a few years back. I always liked trains so I thought I would try out Garden Railroading with Live Steam powered engins. Finally I started a company called Portable Rotation and developed an Ultra-Portable Antenna Rotor System for use by Amateur Radio Operators who are operating Portable and using directional antennas. We olso have developed and are shipping a Dual Axis portable system for Satellite operations. You can read about all the above by following the links to the Right. Design Projects: A number of microcontroller projects I have invented and developed over the years. Amateur Radio: I also enjoy working with Amateur Radio, See my Radio projects here. Contact Info: How to get in touch with me.